His name means Who is as God. Michael ranks as the greatest of all Angels whether in Jewish, Christian or Islamic writings. He is Chief of the Order of Virtues, Chief of Archangels, Prince of the Presence, Angel of Repentance, Righteousness, Mercy and Sanctification: also, Ruler of the 4th Heaven, and Conqueror of Satan. In Jewish lore, he is regarded as the forerunner of the Shekinah. It is foretold in Daniel that when the world is once again in real trouble, Michael will reappear. 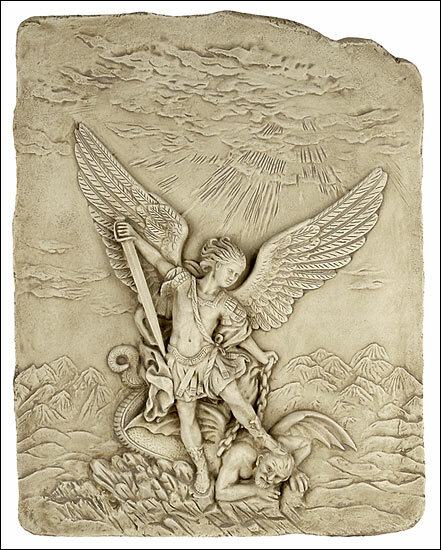 It is Michael who will descend from Heaven with the Key to the Abyss and a great chain in his hand and will bind the Satanic Dragon for 1000 years (Revelation: 20:1). And there was war in heaven: Michael and his Angels fought against the dragon....and the great dragon was cast out. (Revelation: 12:7-9).